Why it’s important to ask questions, remain curious and challenge dogma during a career in biomedicine. It’s this approach to her work as a virologist and a physician that has led to great career success and many research breakthroughs. In 2016, Professor Subbarao was appointed Director of the WHO Collaborating Centre for Reference and Research on Influenza at the Doherty Institute. Her role is to advise the World Health Organization on viruses to be included in annual seasonal influenza vaccines. “The WHO Centre is very well respected internationally and the opportunity to be leading it is a real honour,” she says. Professor Subbarao is a Fellow of the American Academy of Microbiology and the Infectious Diseases Society of America. And, the professor of the School of Biomedical Sciences, University of Melbourne, also serves on the Editorial Board of PLoS Pathogens and mBio. “I had excellent training in clinical medicine, but as I became more confident in the practice of medicine, I found myself more and more interested in explanations of why and how things worked,” she says. In the past, Professor Subbarao’s research focus was on newly emerging viral diseases of global importance including pandemic influenza, severe acute respiratory syndrome (SARS) and Middle East Respiratory Syndrome (MERS). Her current research efforts are directed at understanding the biology and immune responses to influenza viruses and vaccines. She has authored more than 175 peer-reviewed publications in leading journals such as Science, Nature, PNAS and the Journal of Virology, and 50 reviews or chapters – a majority on influenza and SARS. 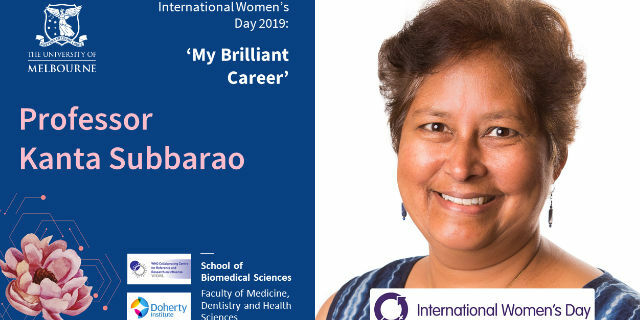 Early on in her career, Professor Subbarao says: “I was surprised that people would question the judgement of women, purely because they were women. Thankfully, there’s been a lot of progress in this area and young women today don’t face as much overt sexism”. When it comes to further advancements for women in biomedicine, Professor Subbarao adds: “There is still a relative dearth of senior women scientists and a drop off in the number of women at the mid-career level. I would like to see this change. I would like to see more women physicians in basic and translational research careers”. Balance for Better, the theme of this year’s International Women’s Day, is about the importance – and benefits – of workplace equality, she concludes. Read more about the illustrious careers of female leaders in medical research in the School of Biomedical Sciences ‘My Brilliant Career’ profile series. 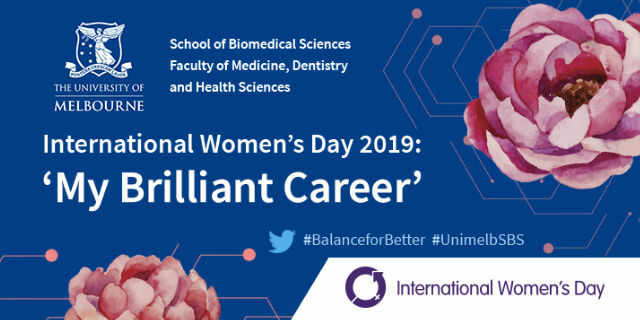 Hear more from Professor Subbarao and the panel of leading women in biomedicine in the International Women’s Day: My Brilliant Career podcast. Available from Friday afternoon, 8 March.